Before the invention of the gasoline-powered engine, mechanical transportation was fueled by steam. In fact, the concept of a steam engine pre-dates modern engines by a couple thousand years as mathametician and engineer Heron of Alexandria, who lived in Roman Egypt during the first century, was the first to describe a rudimentary version he named the Aeolipile. Along the way, a number of leading scientists who toyed with the idea of using the force generated by heating water to power a machine of some sort. One of them was none other than Leonardo Da Vinci who drew up designs for a steam powered cannon called the Architonnerre sometime during the 15th century. A basic steam turbine was also detailed in papers written by the Egyptian astronomer, philosopher and engineer Taqi ad-Din in 1551. However, the real groundwork for the development of a practical, working motor didn't come about until the mid-1600s. It was during this century that several inventors were able to develop and test water pumps as well as piston systems that would pave the way for the commercial steam engine. From that point, the commercial steam engine was then made possible by the efforts of three important figures. Thomas Savery was an English military engineer and inventor. In 1698, he patented the first crude steam engine based on Denis Papin's Digester or pressure cooker of 1679. Savery had been working on solving the problem of pumping water out of coal mines when he came up with an idea for an engine powered by steam. His machine consisted of a closed vessel filled with water in which steam under pressure was introduced. This forced the water upwards and out of the mine shaft. A cold water sprinkler was then used to condense the steam. This created a vacuum which sucked more water out of the mine shaft through a bottom valve. Thomas Savery later worked with Thomas Newcomen on the atmospheric steam engine. Among Savery's other inventions was an odometer for ships, a device that measured distance traveled. To learn more about Thomas Savery the inventor, check out his biography. I've also written a description of Savery’s crude steam engine. Thomas Newcomen was an English blacksmith who invented the atmospheric steam engine. The invention was an improvement over Thomas Slavery's previous design. The Newcomen steam engine used the force of atmospheric pressure to do the work. This process begins with the engine pumping steam into a cylinder. The steam was then condensed by cold water, which created a vacuum on the inside of the cylinder. The resulting atmospheric pressure operated a piston, creating downward strokes. With Newcomen's enginee, the intensity of pressure was not limited by the pressure of the steam, a departure from what Thomas Savery had patented in 1698. In 1712, Thomas Newcomen, together with John Calley, built their first engine on top of a water filled mine shaft and used it to pump water out of the mine. The Newcomen engine was the predecessor to the Watt engine and it was one of the most interesting pieces of technology developed during the 1700's. To learn more about Thomas Newcomen and his steam engine, check out this biography. Photos and a diagram of Newcomen’s steam engine can be found at Niagara college’s professor Mark Csele’s website. 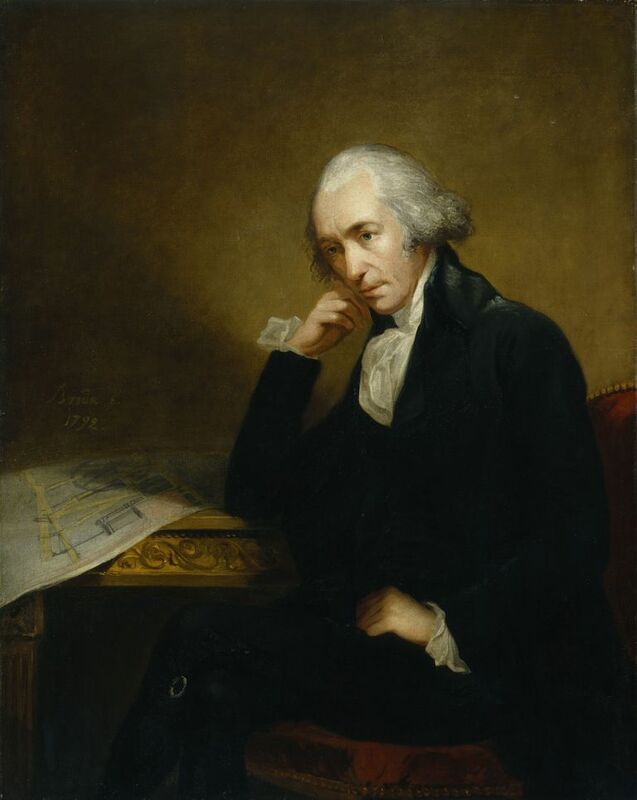 Born in Greenock, James Watt was a Scottish inventor and mechanical engineer who was renowned for the improvements he made to the steam engine. While working for the University of Glasgow in 1765, Watt was assigned the task of repairing a Newcomen engine that was deemed inefficient but the best steam engine of its time. That started the inventor working on several improvements to Newcomen's design. The most notable improvement was Watt's 1769 patent for a separate condenser connected to a cylinder by a valve. Unlike Newcomen's engine, Watt's design had a condenser that could be cool while the cylinder was hot. Eventually Watt's engine would become the dominant design for all modern steam engines and helped bring about the industrial revolution. A unit of power called the Watt was named after James Watt. the Watt symbol is W, and it is equal to 1/746 of a horsepower, or one volt times one amp.